Stormwater ponds help to protect receiving waters by settling out pollutant-laden sediment that is carried in urban stormwater runoff. Similar to other municipal infrastructure such as roads, sewers, and treatment plants, the effective long-term operation of stormwater management ponds and wetlands relies on effective inspection and maintenance practices. If stormwater facilities are not maintained, runoff will enter rivers and water bodies without adequate treatment, resulting in significant adverse effects on aquatic ecosystems and downstream swimming areas. 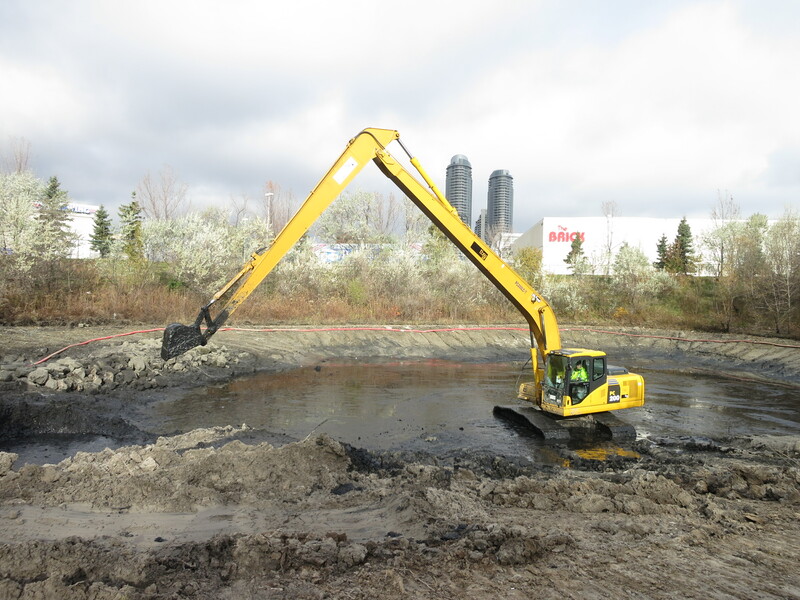 Municipalities in Ontario first began implementing wet ponds as part of their stormwater infrastructure in the late 1980’s. Today, there are over 1000 stormwater ponds and wetlands within the Greater Toronto Area. Current regulations require that stormwater facilities be inspected and maintained to ensure they are functioning as per their original design. The largest and most costly maintenance task involves the removal, hauling and safe disposal of potentially contaminated sediment. Several municipalities are only now recognizing the magnitude of this effort, and designating funds to address the problem. It is hoped that sharing information on effective and economical approaches to stormwater pond maintenance and highlighting the importance of maintenance activities will help encourage pond owners to follow best practices and improve the long term operation and maintenance of these facilities.